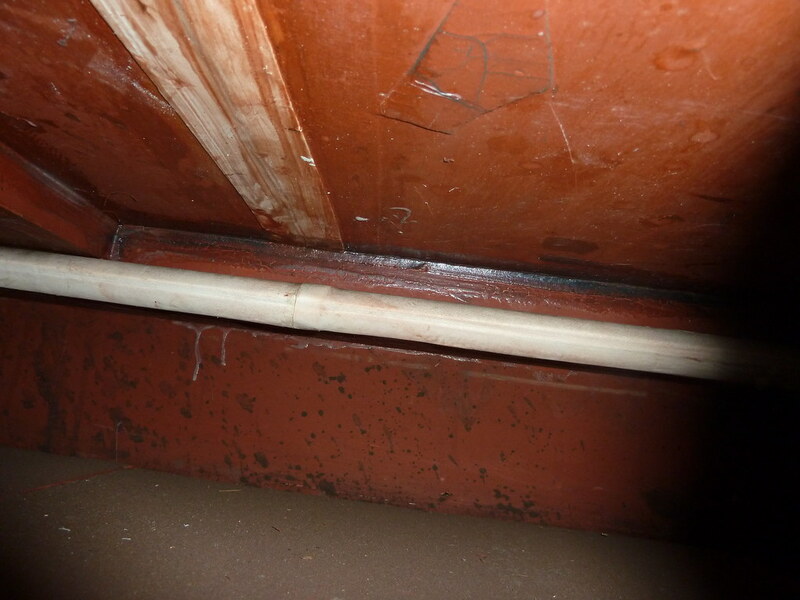 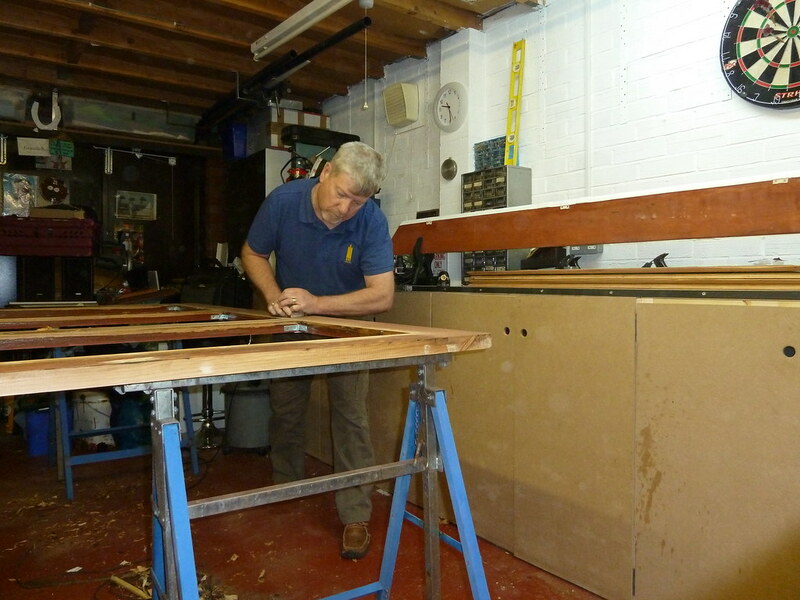 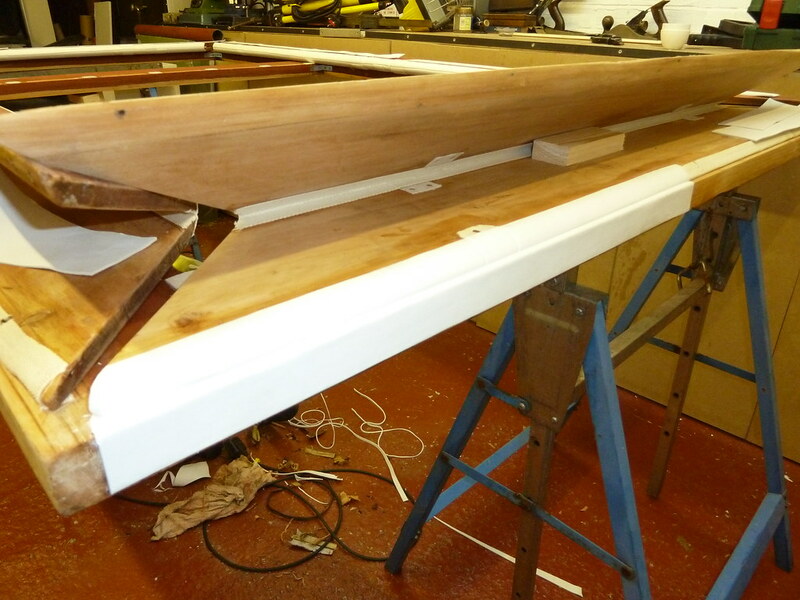 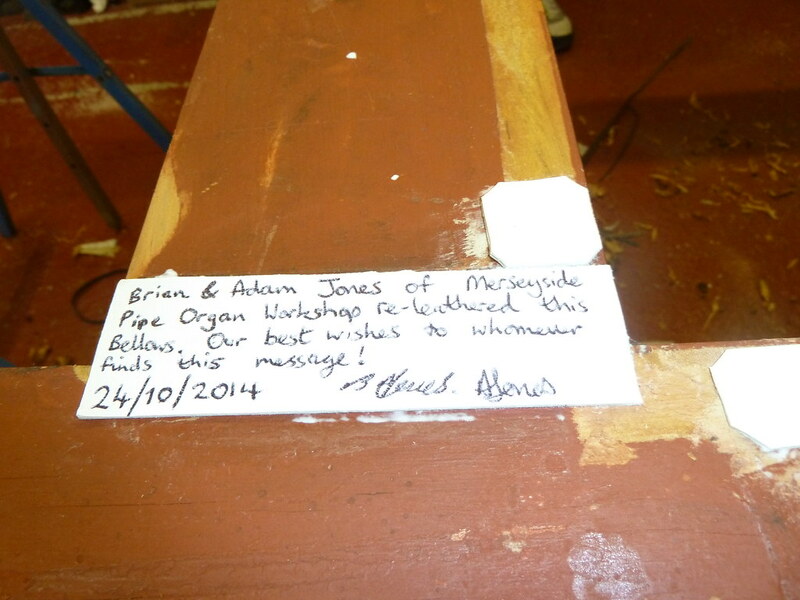 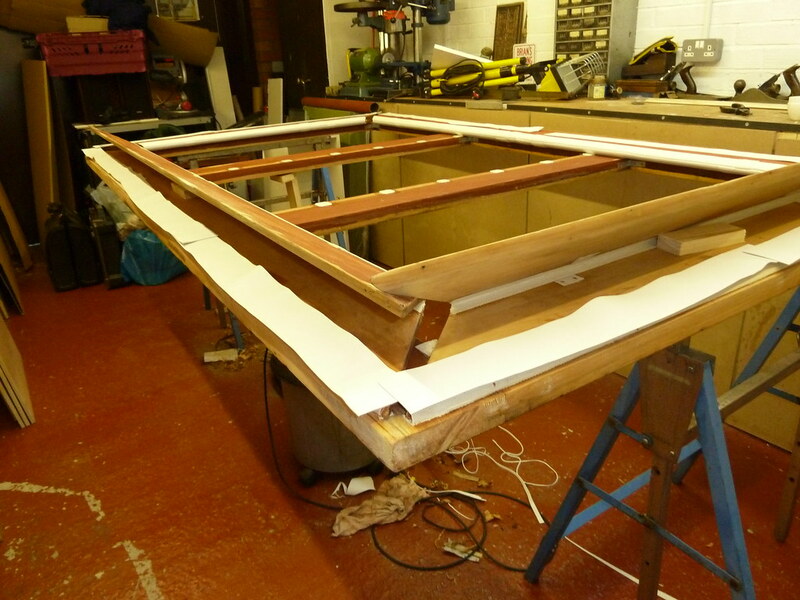 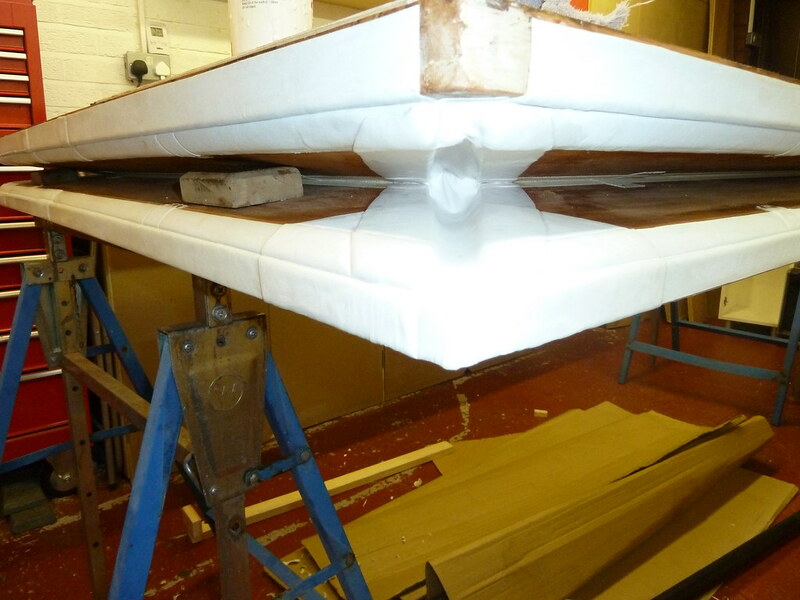 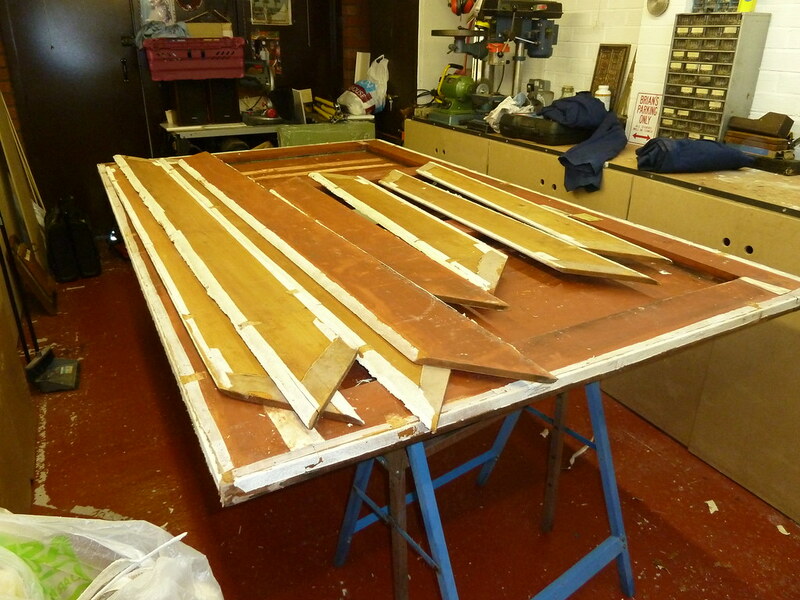 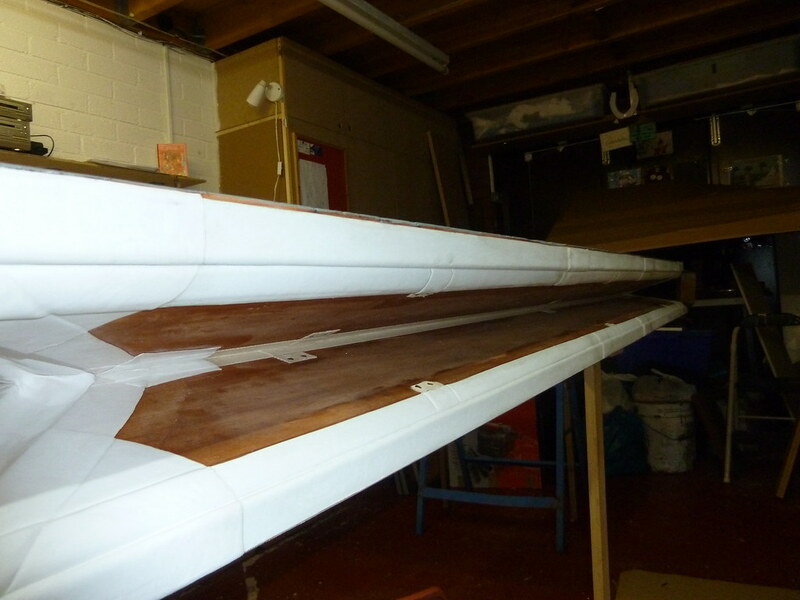 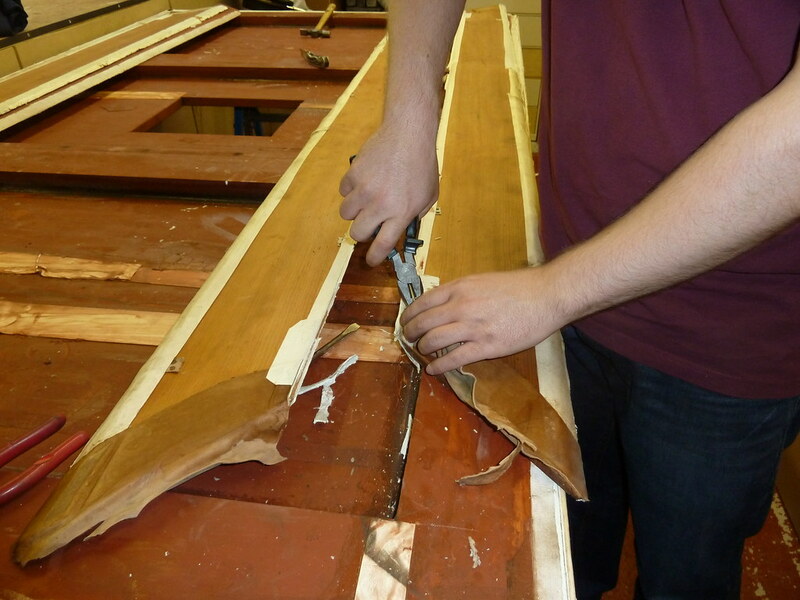 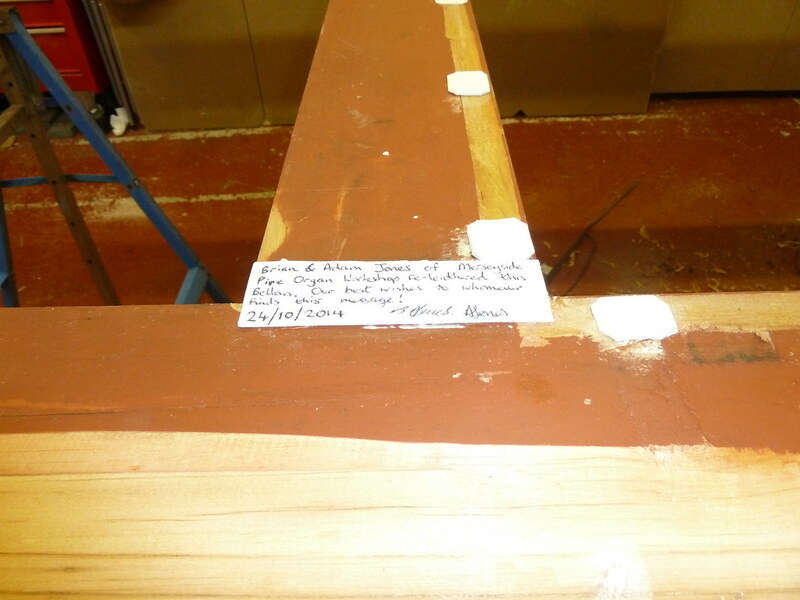 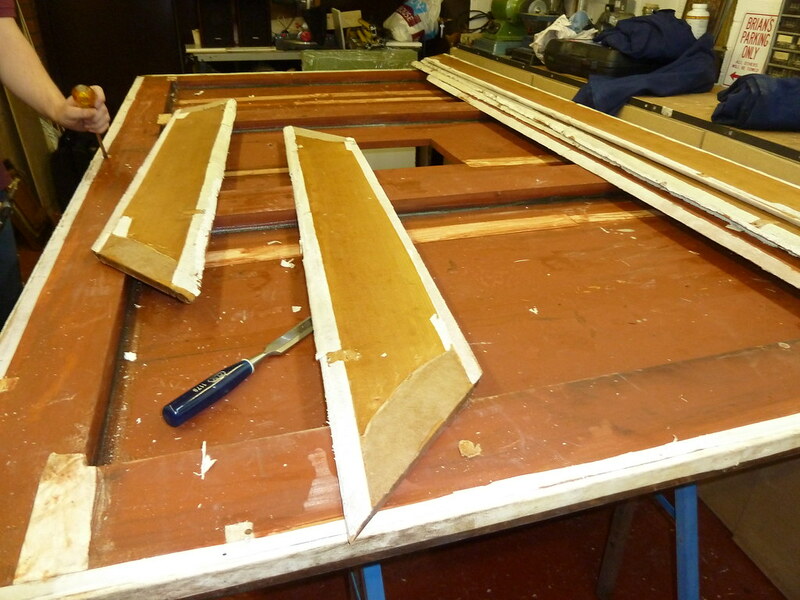 Here are some pictures that Brian & Adam Jones of Merseyside Pipe Organs took showing some of the work that they had to undertake before bringing the air reservoir back. 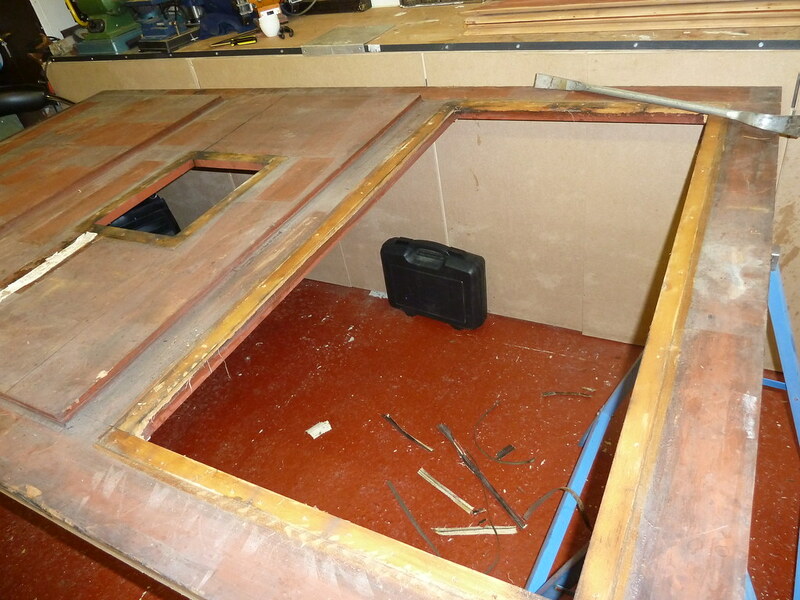 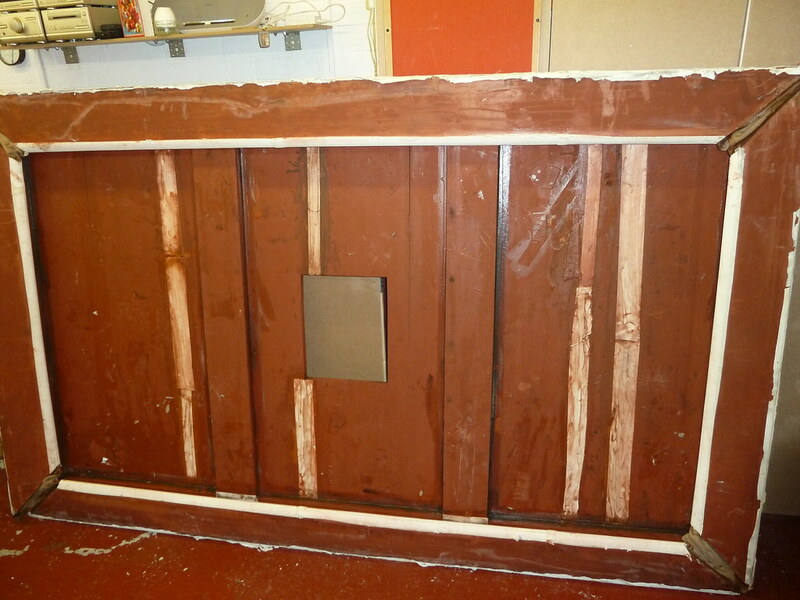 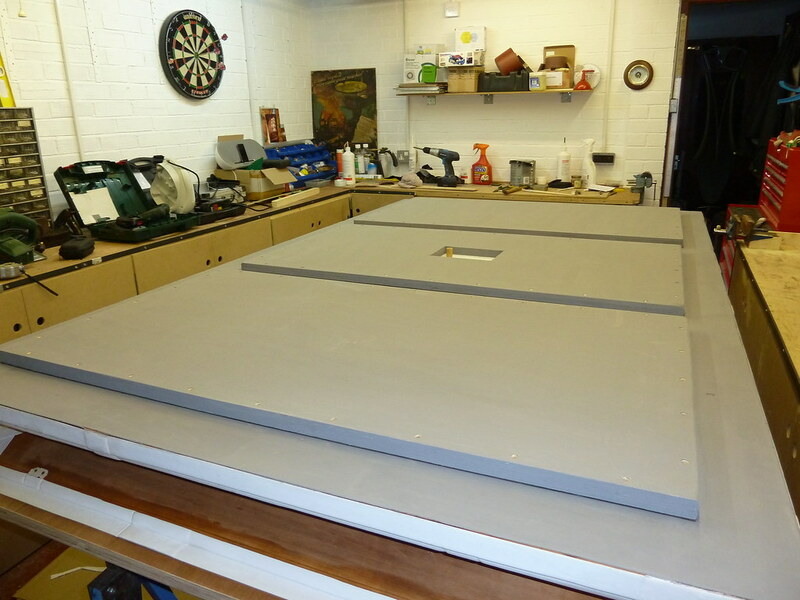 The top of the air reservoir in situ in the basement before being taken away. 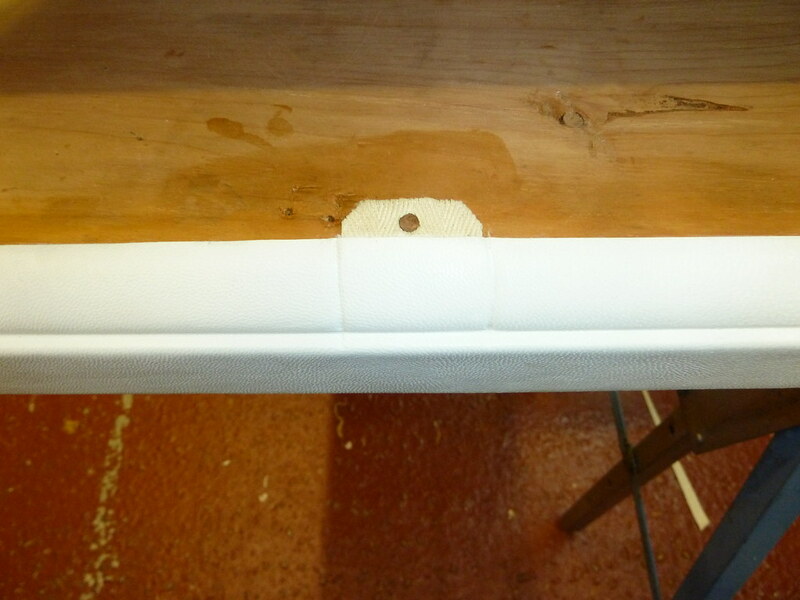 The square hole is the emergency air release in case it overfilled. 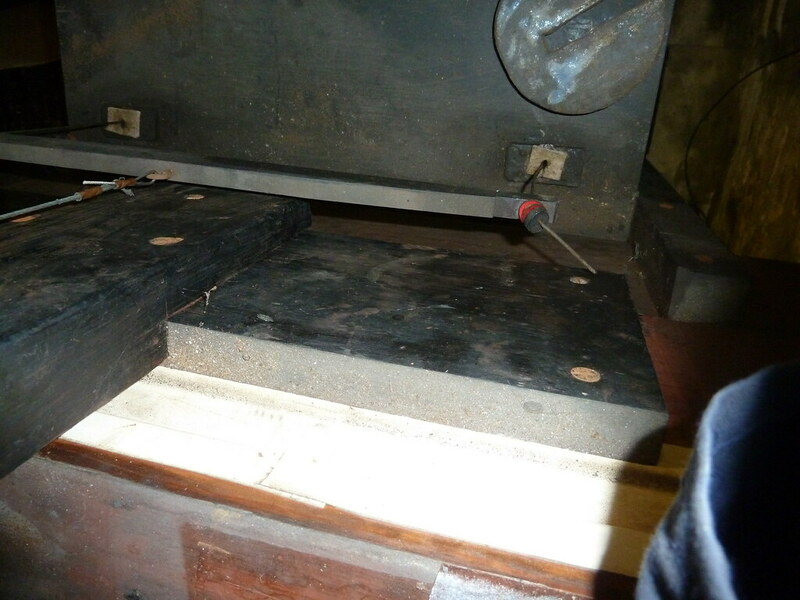 The darker rectangles are were the heavy cast iron weighs were placed before being taken off. 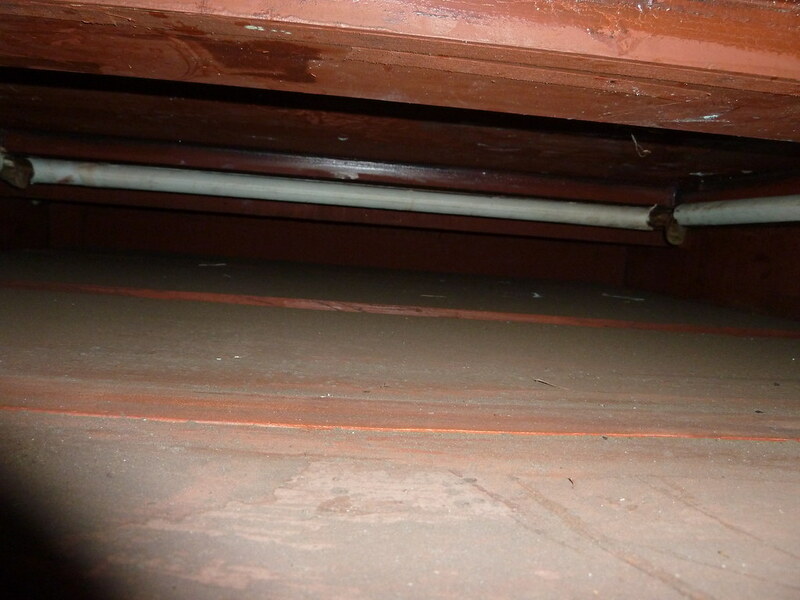 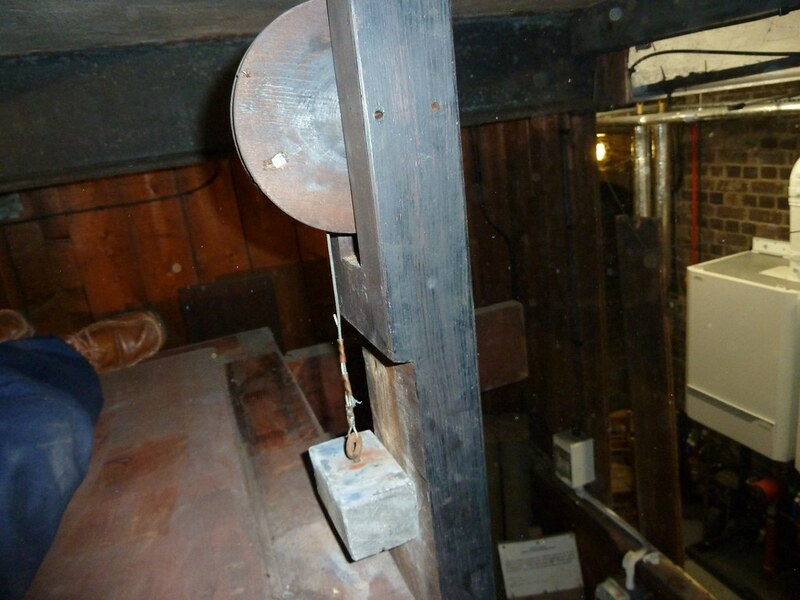 This shows the counterbalance weight on the air reservoir. 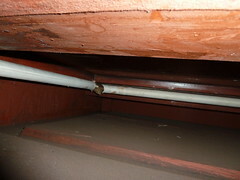 This is attached to a thick blind inside a box between the air reservoir and blower. 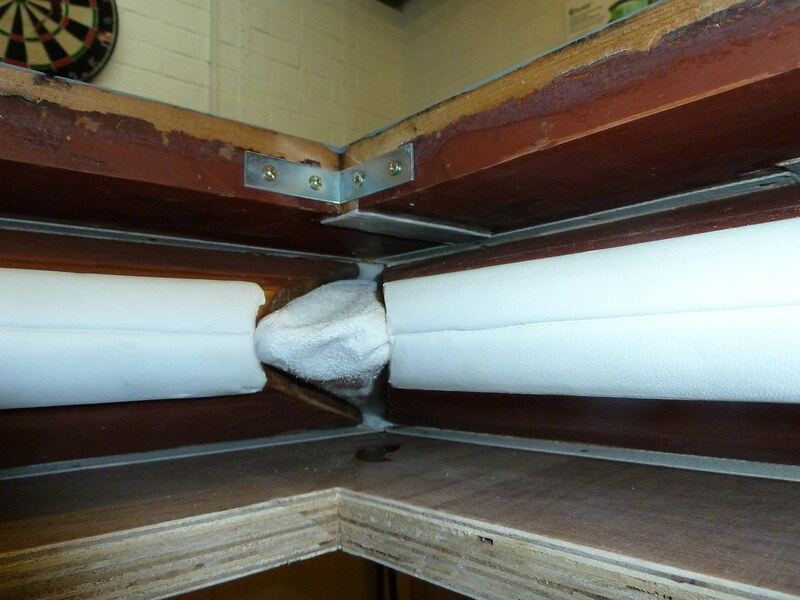 When the air reservoir gets too full the blind is lowered to stop the blower overfilling the air reservoir. 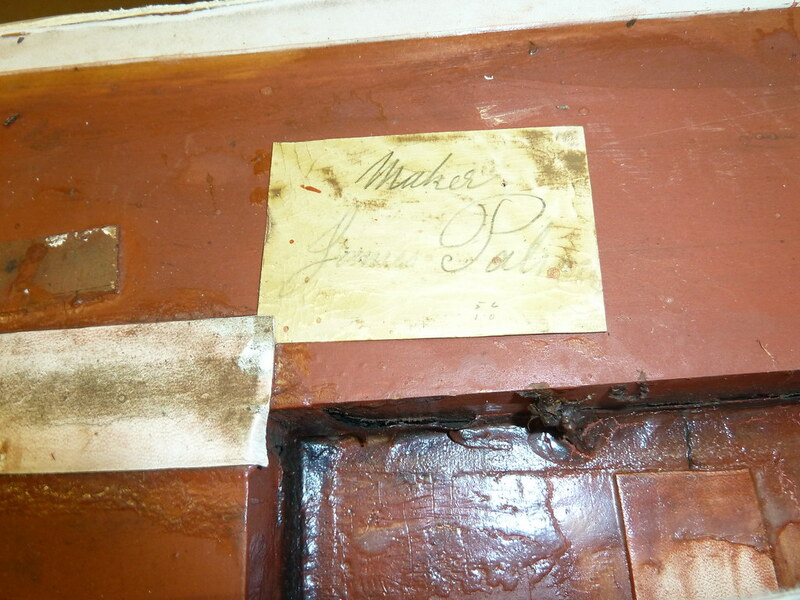 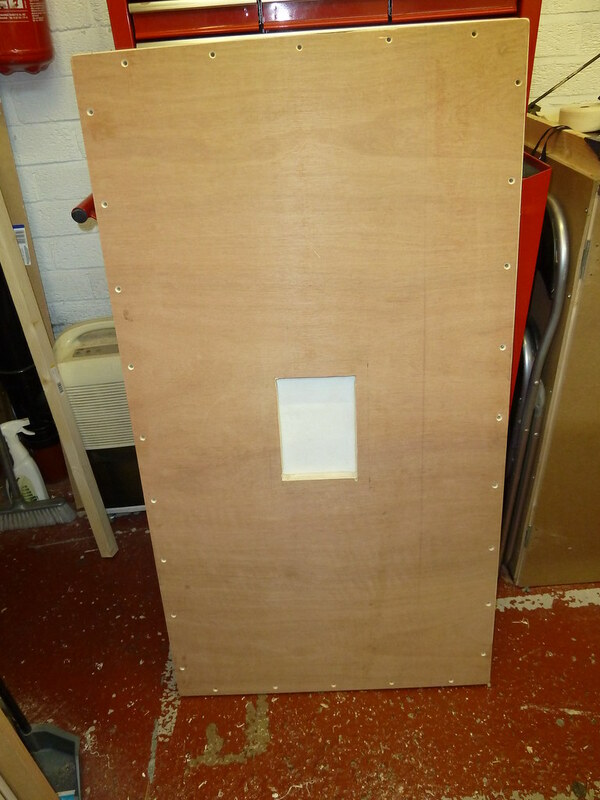 This shows the top of the box that contains the blind mentioned in the previous photograph. 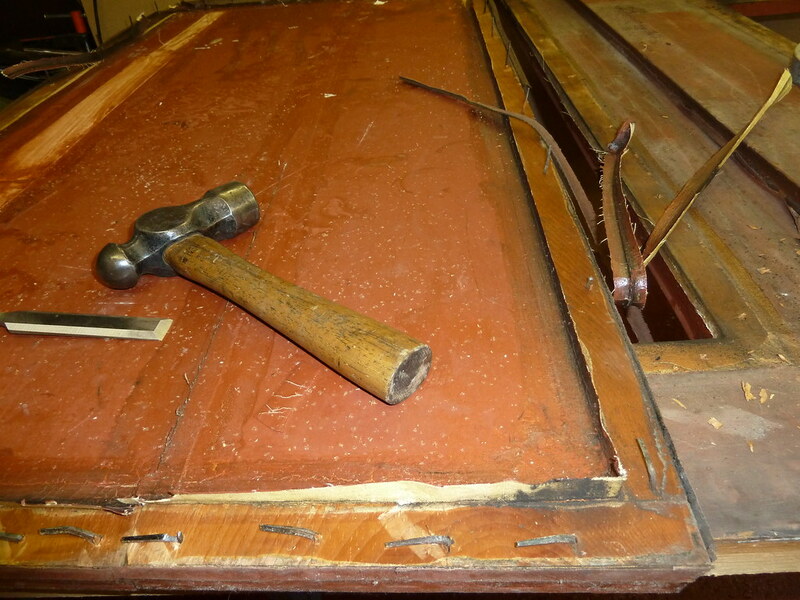 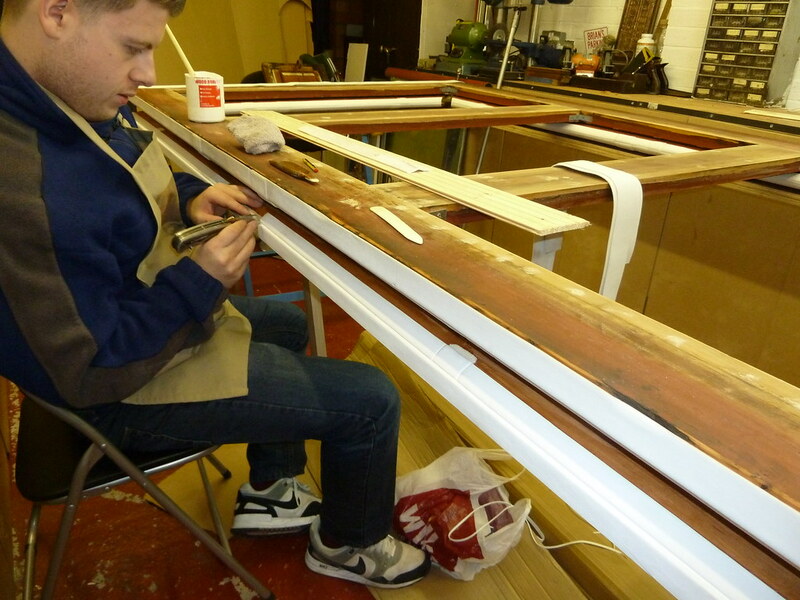 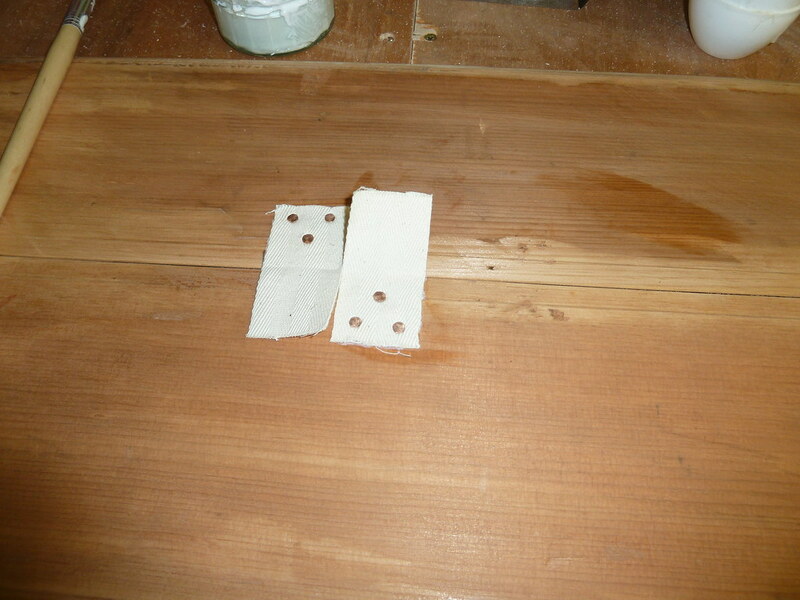 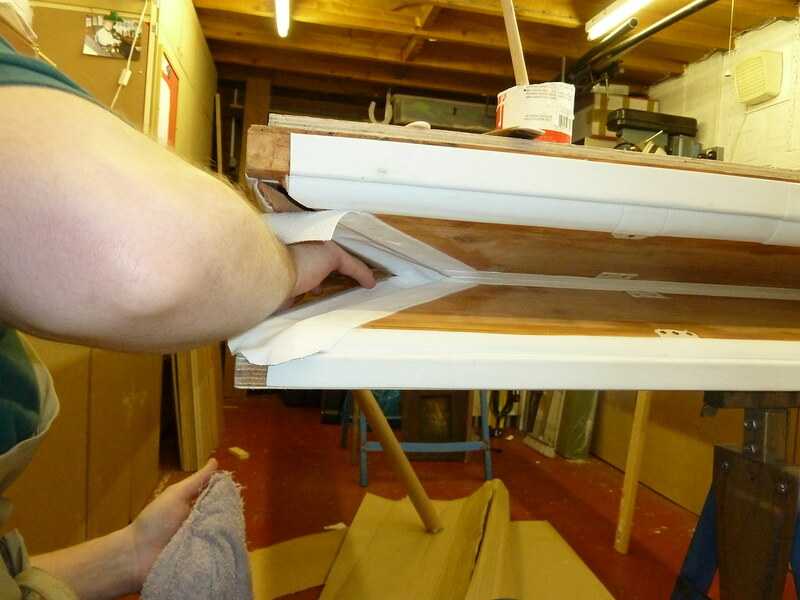 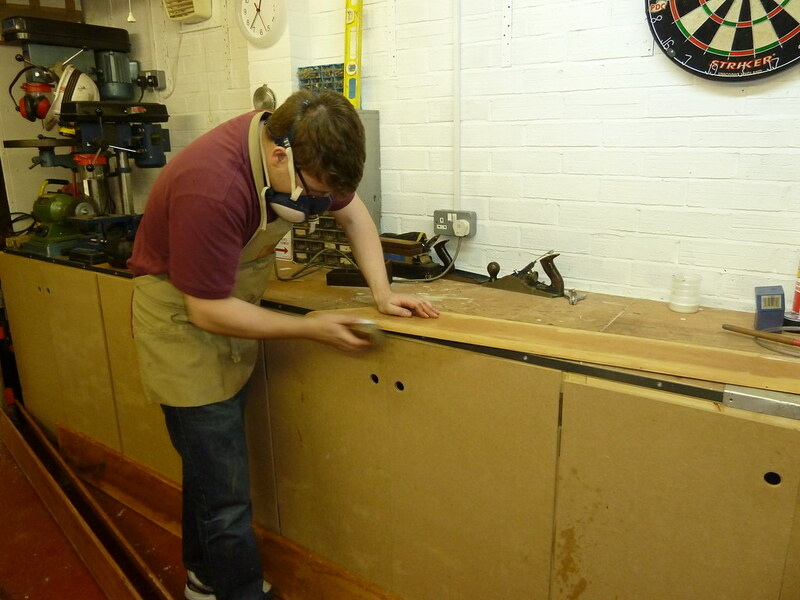 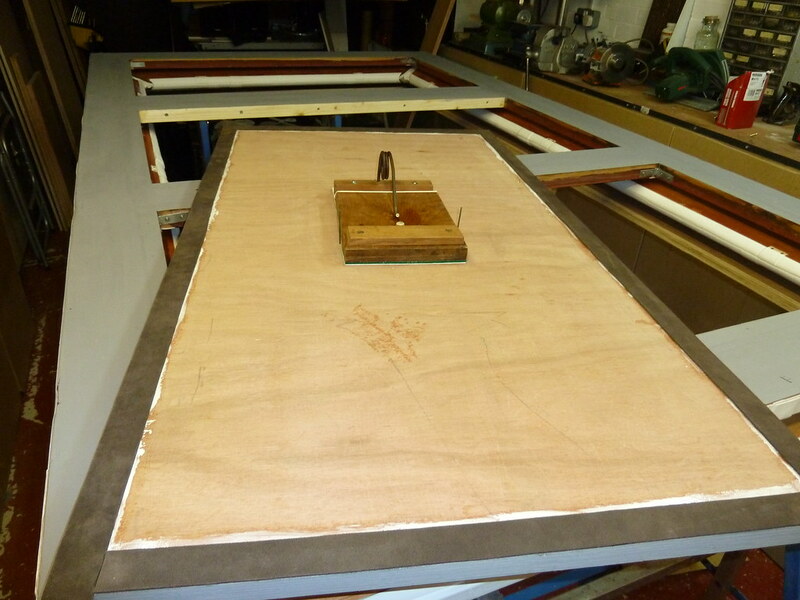 The blind is attached to a piece of wood which in turn is attached to a weight. 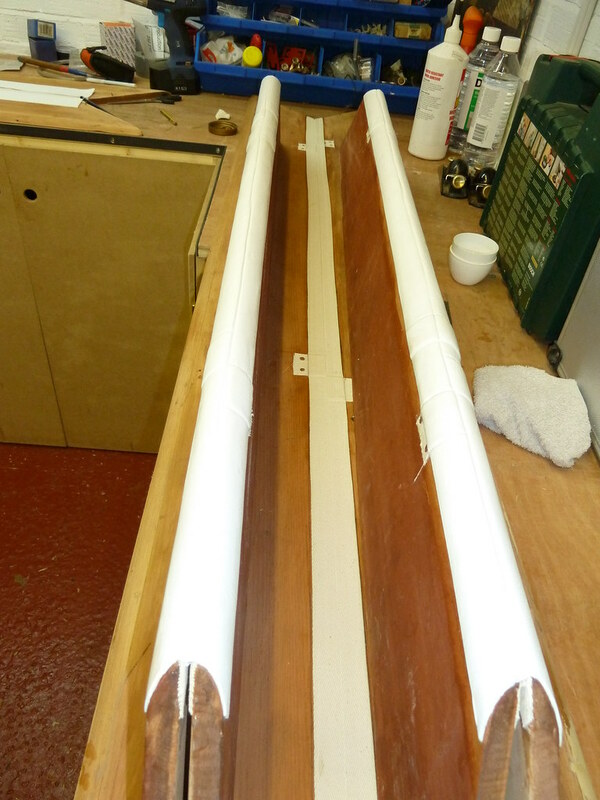 This moves as the air reservoir fills. 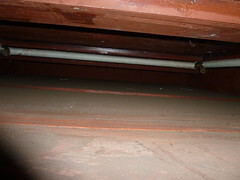 Interior of the air reservoir facing away from the blower. 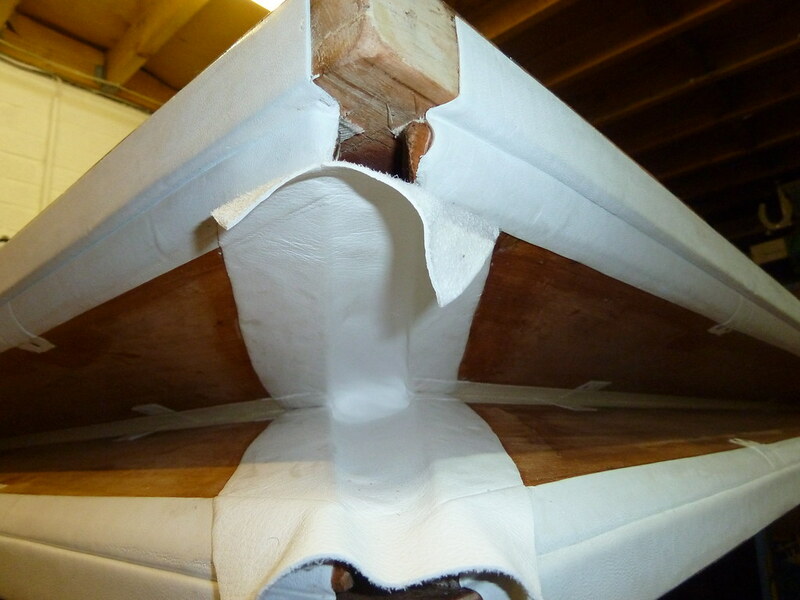 This is probably the first time the interior of this has been seen since it was made. 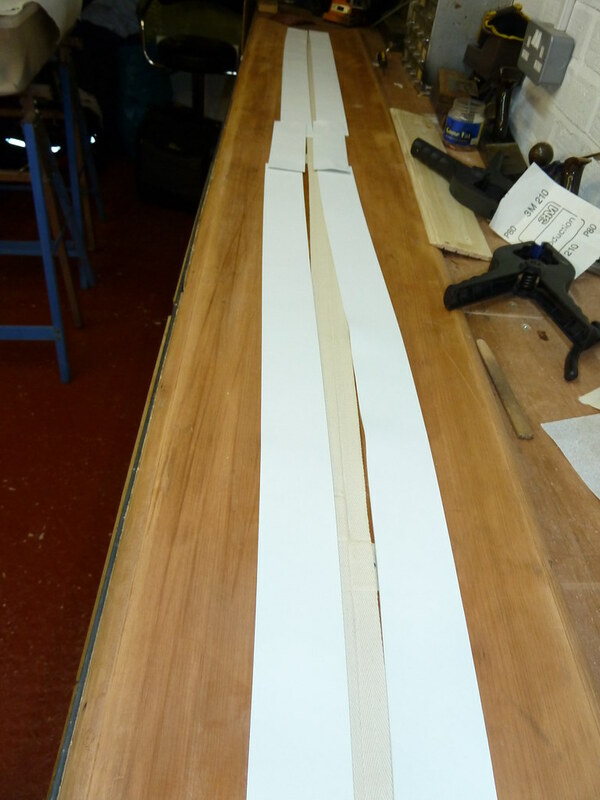 The white strips are leather. 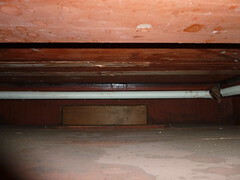 Interior of the air reservoir facing towards the blower. 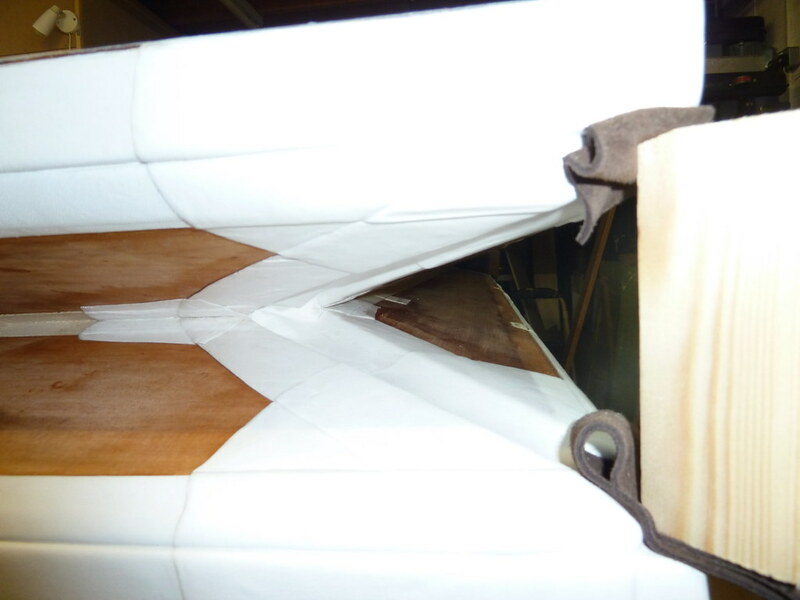 This is probably the first time the interior of this has been seen since it was made. 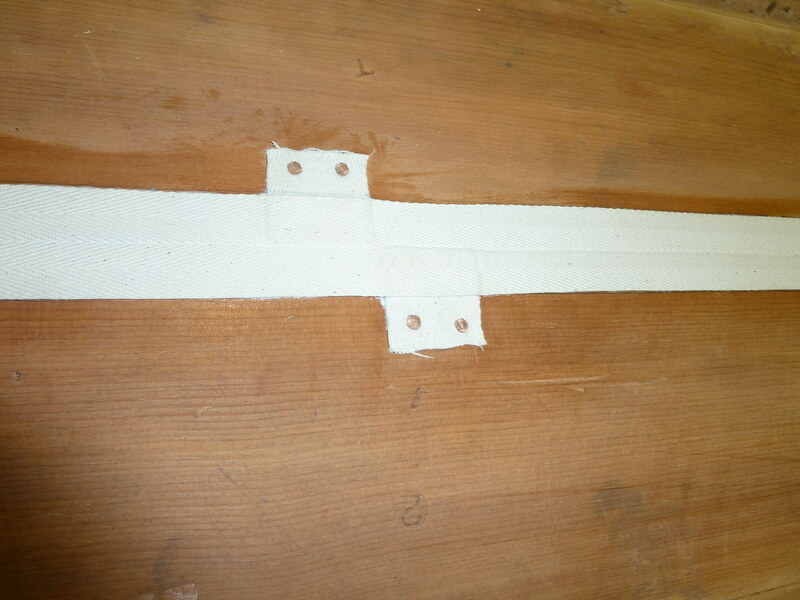 The white strips are leather. 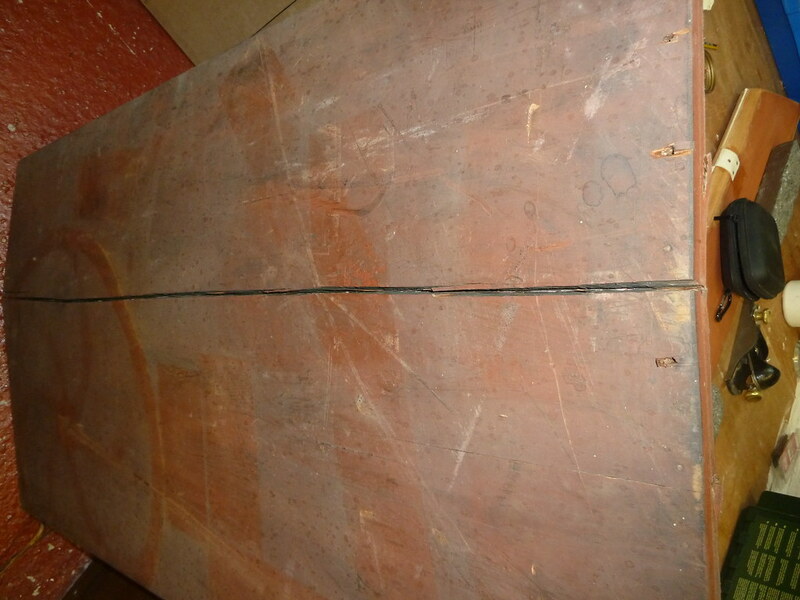 It also shows seriously degraded leather on the top of the box and the amount of dirt that this inside. Interior of the air reservoir. 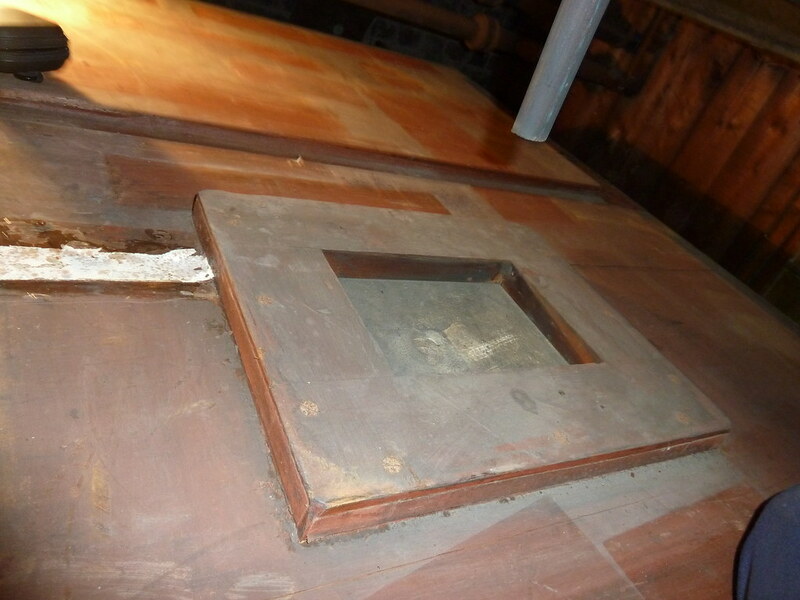 This shows how much dirt has accumulated inside the box after over 100 years. The top of the bellows in the workshop of Merseyside Pipe Organs. 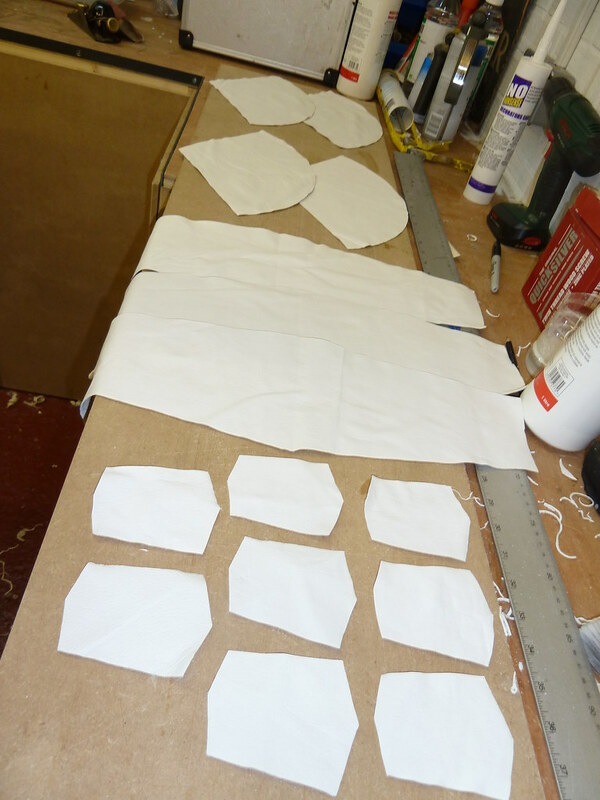 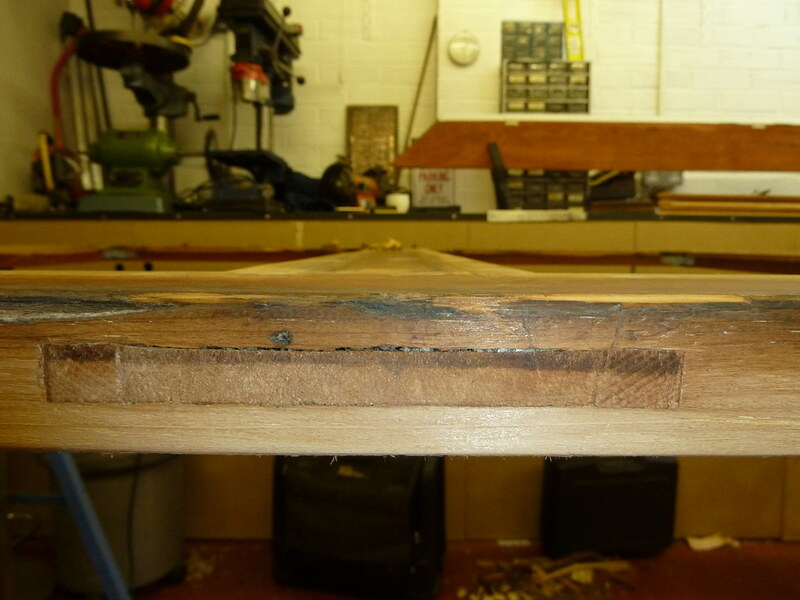 This shows how worn the gussets are and how much patching has gone on in the corners over the years. The interior lid. 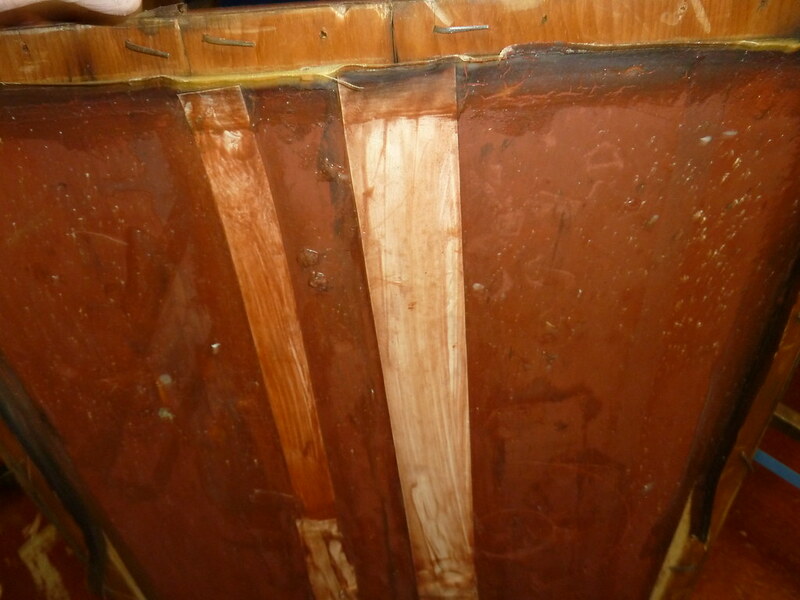 This show how much damage has been cause to over the years due to the wood shrinking. 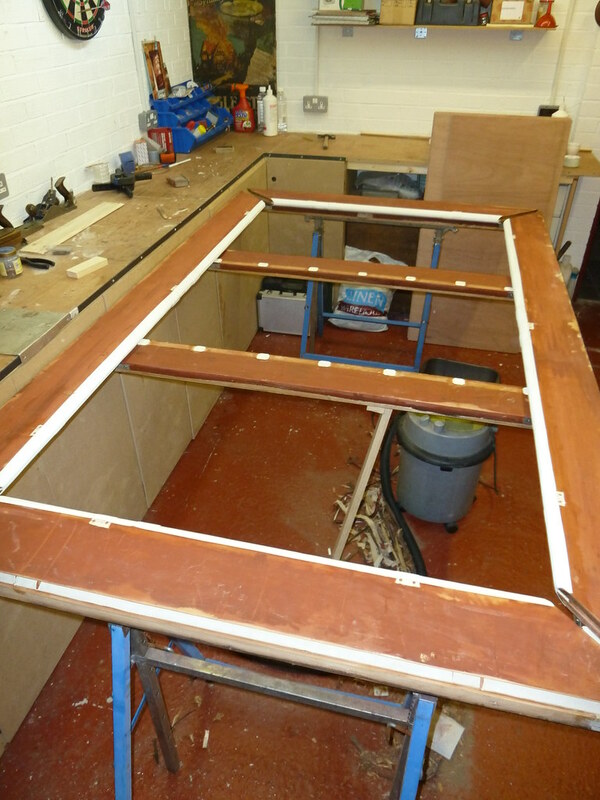 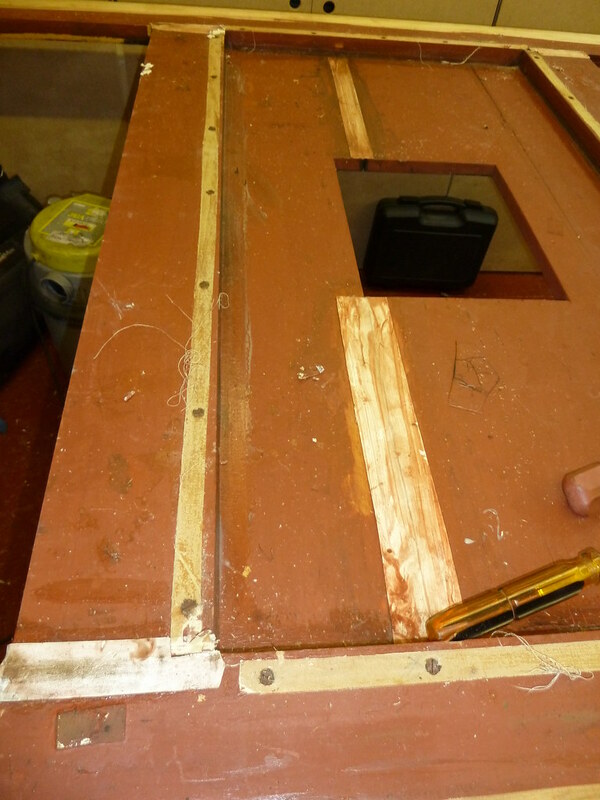 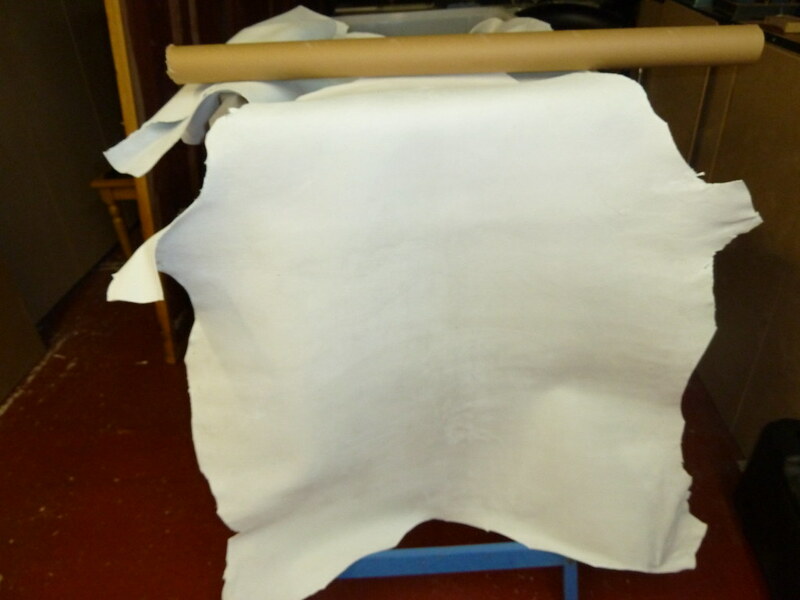 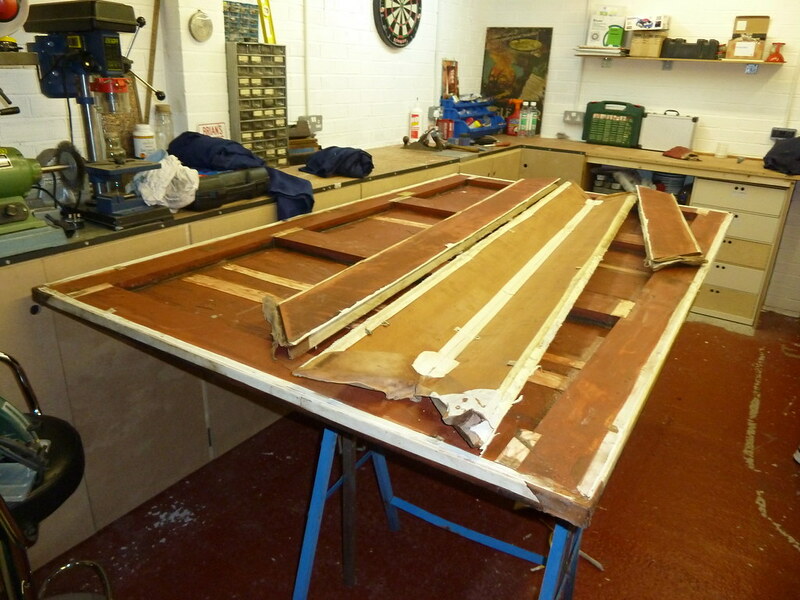 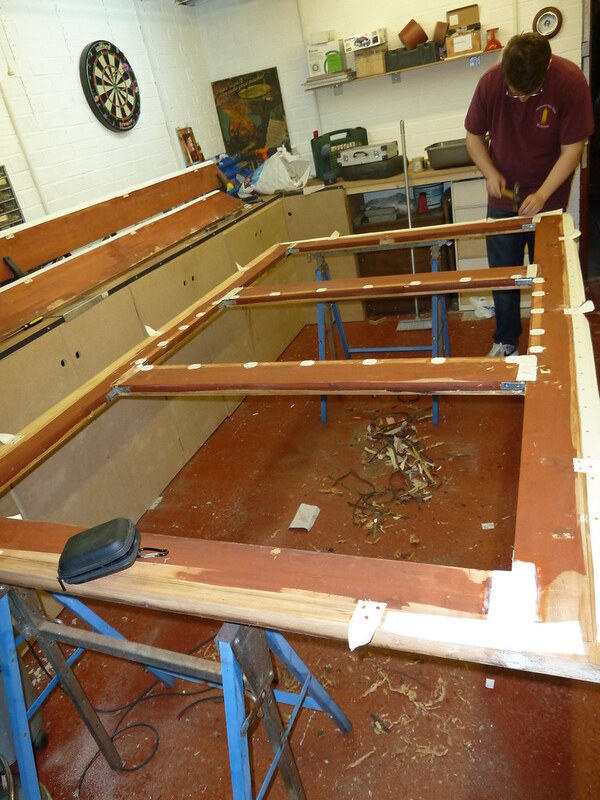 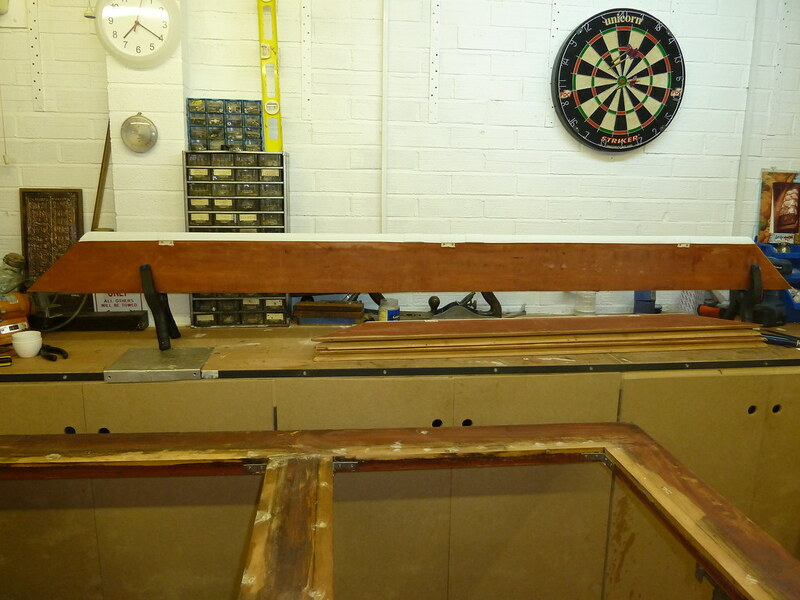 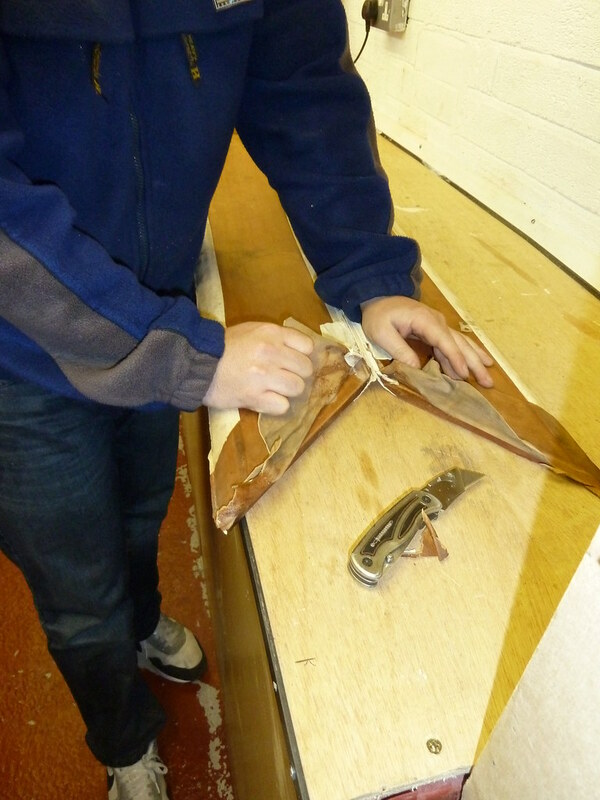 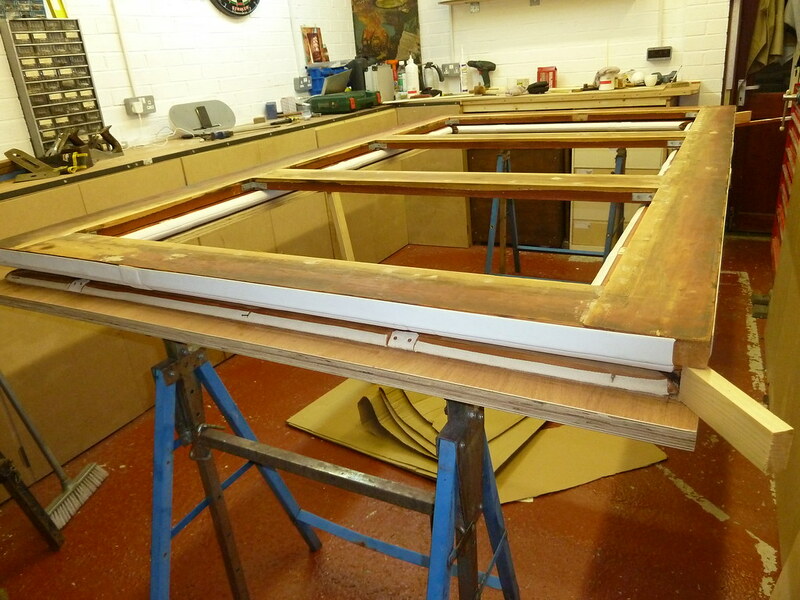 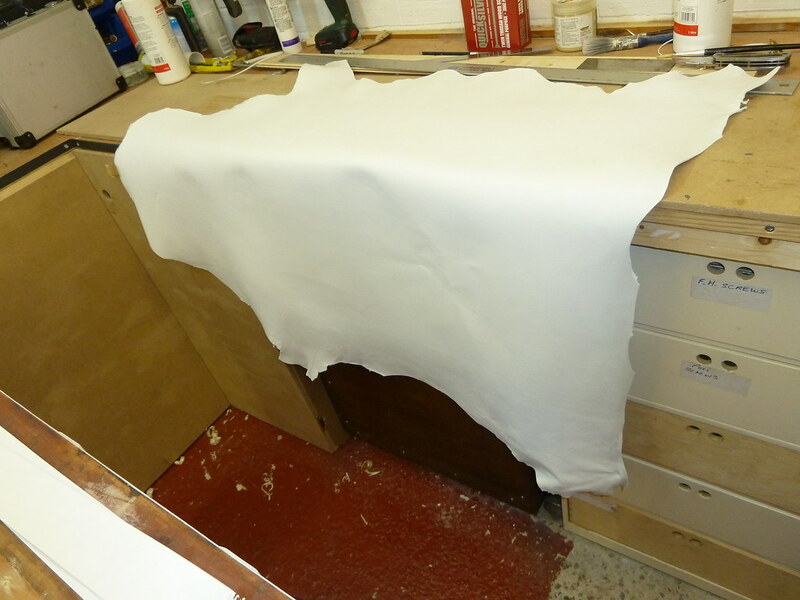 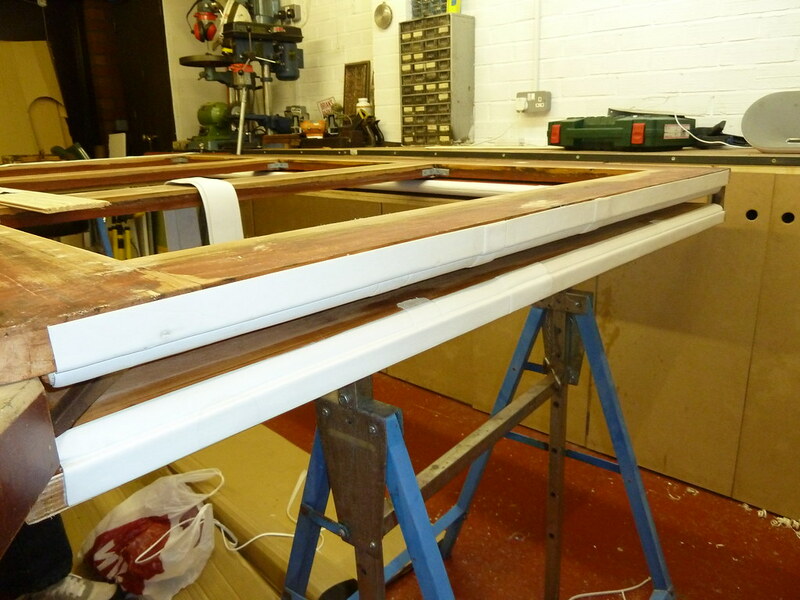 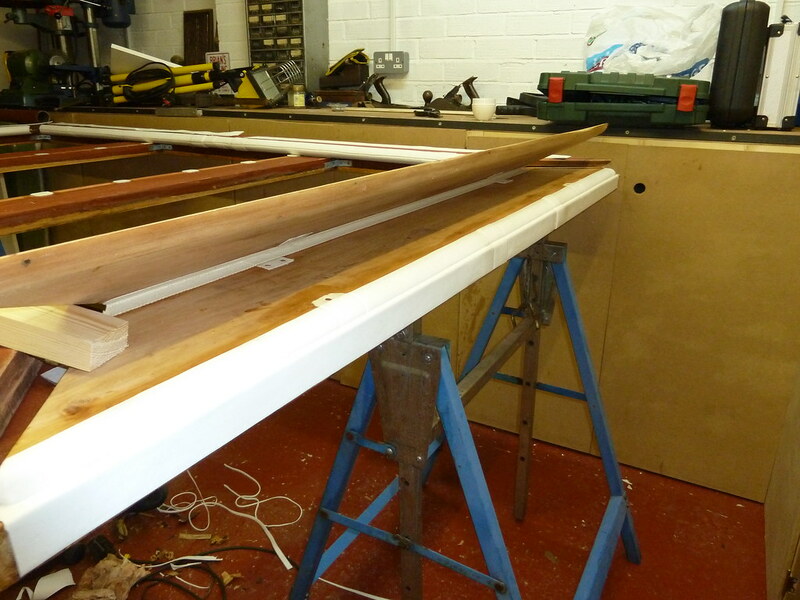 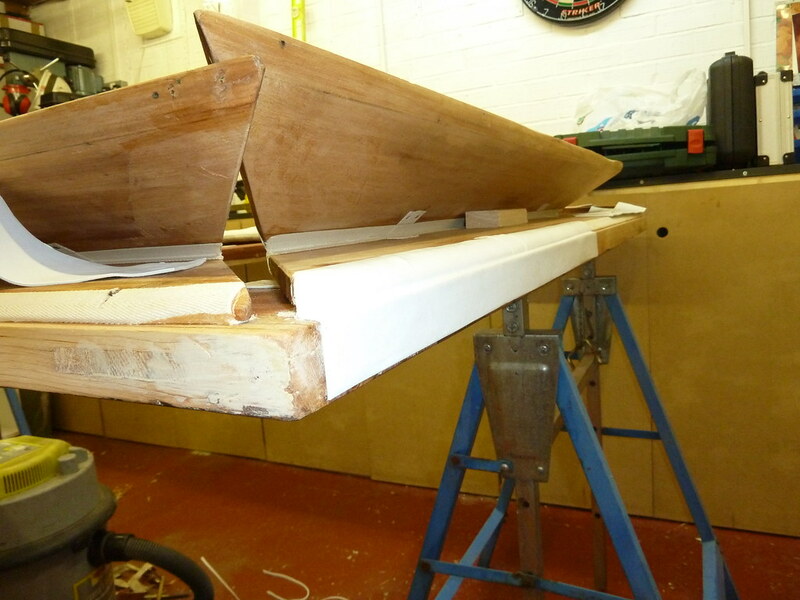 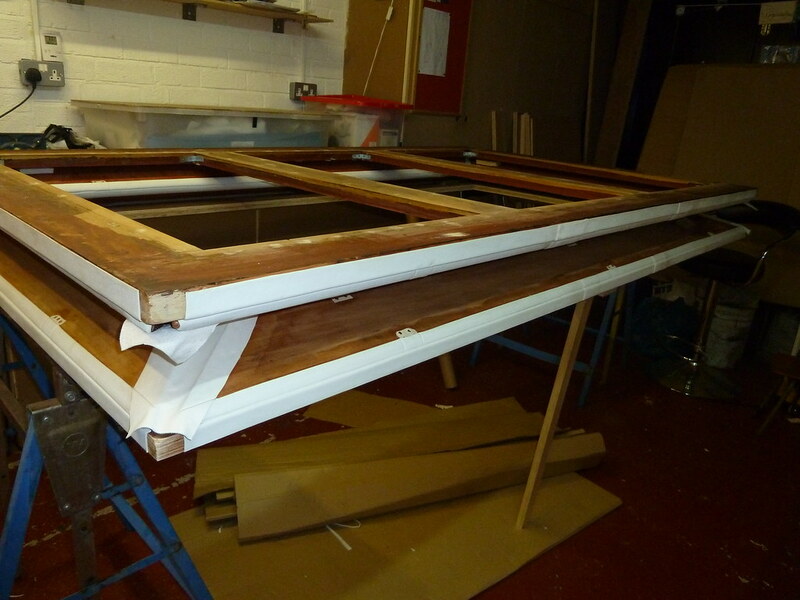 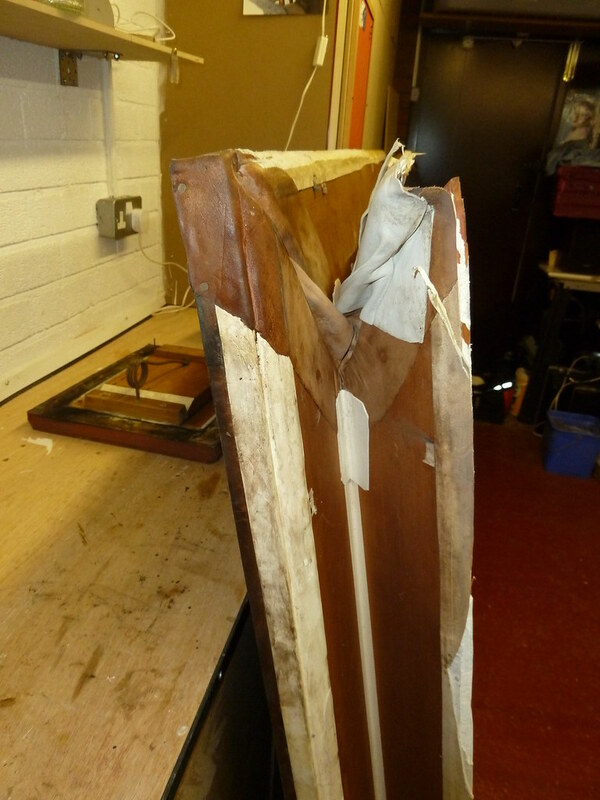 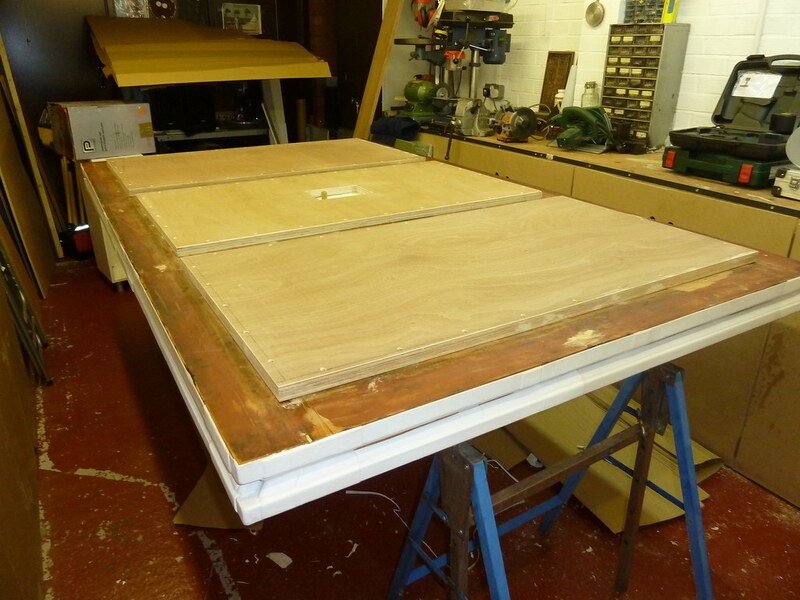 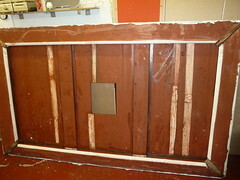 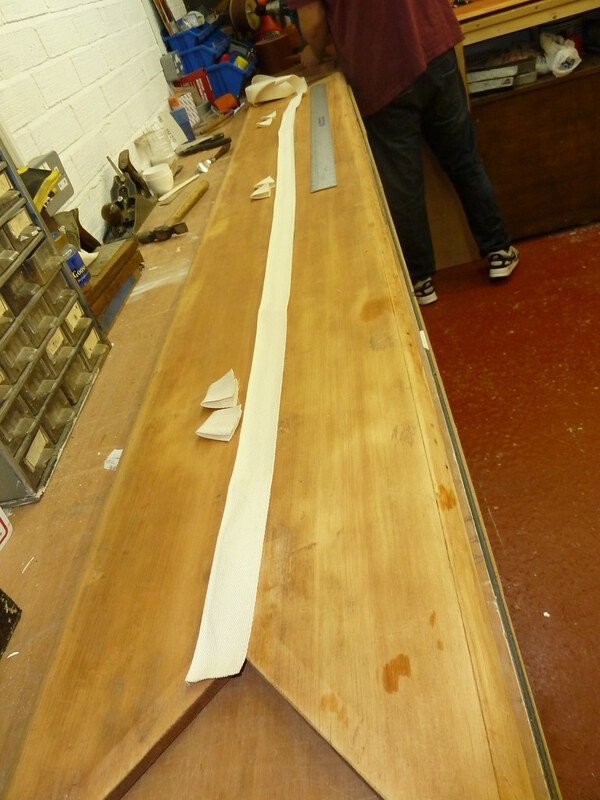 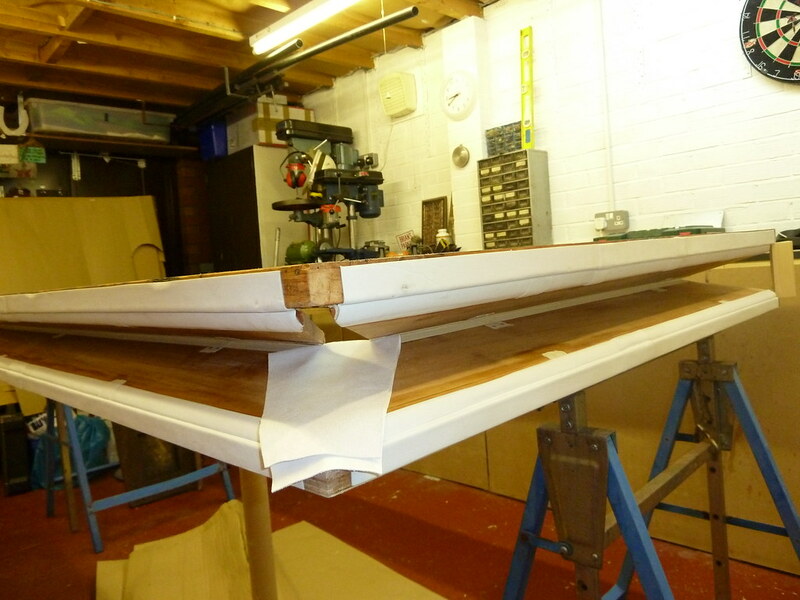 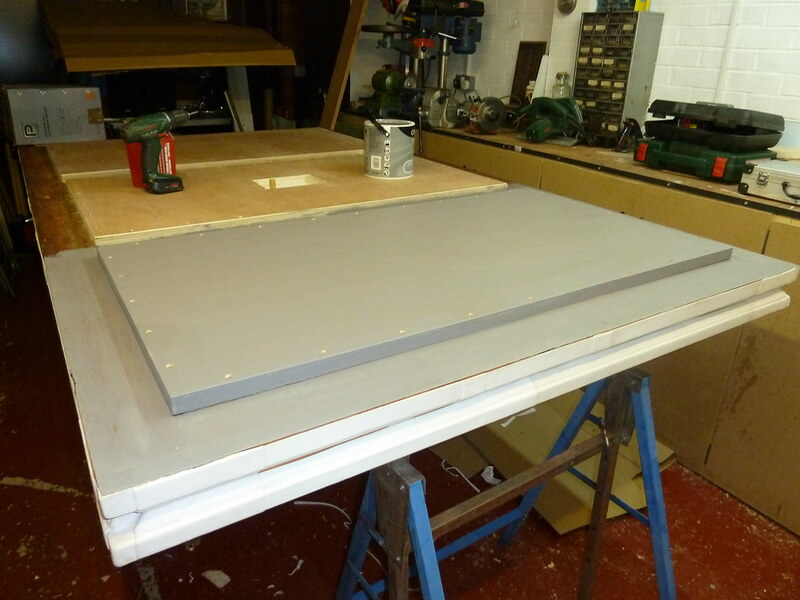 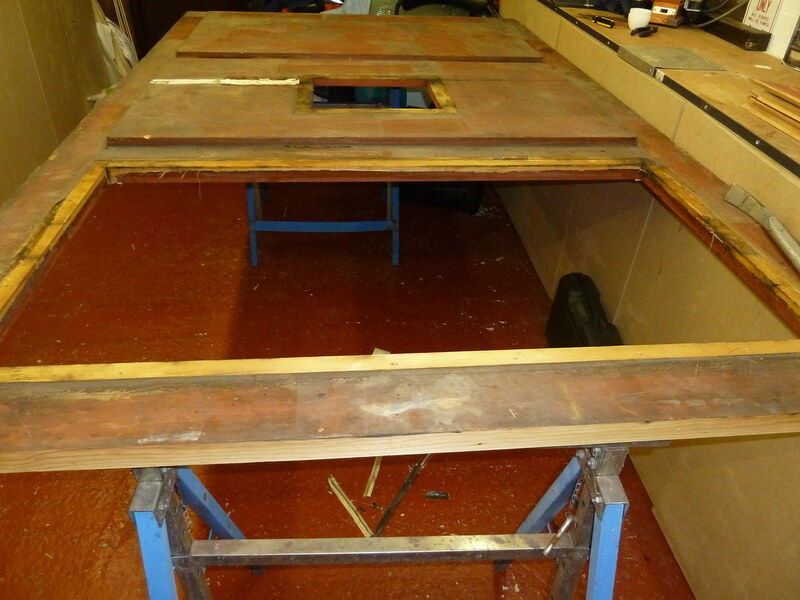 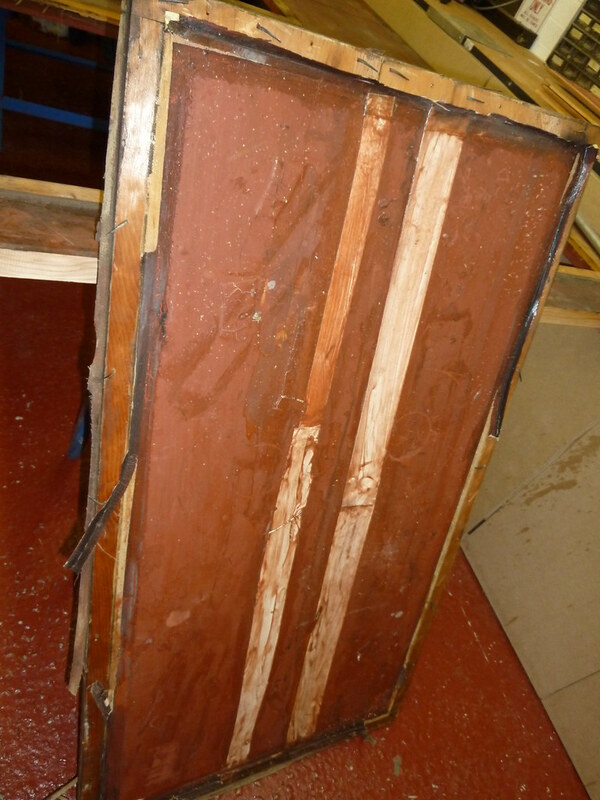 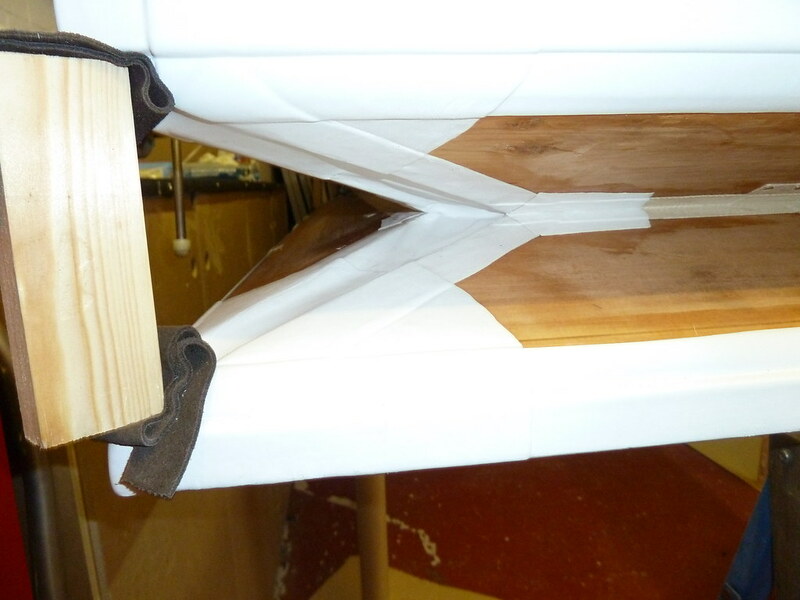 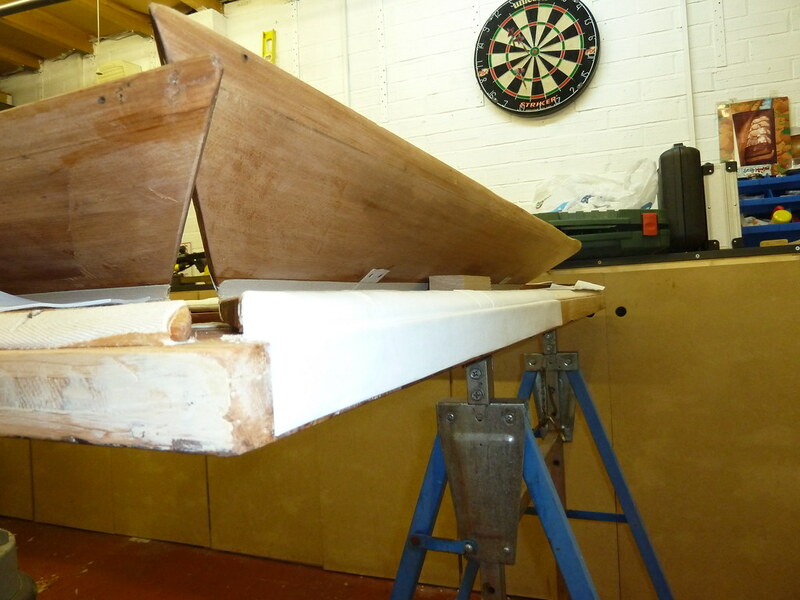 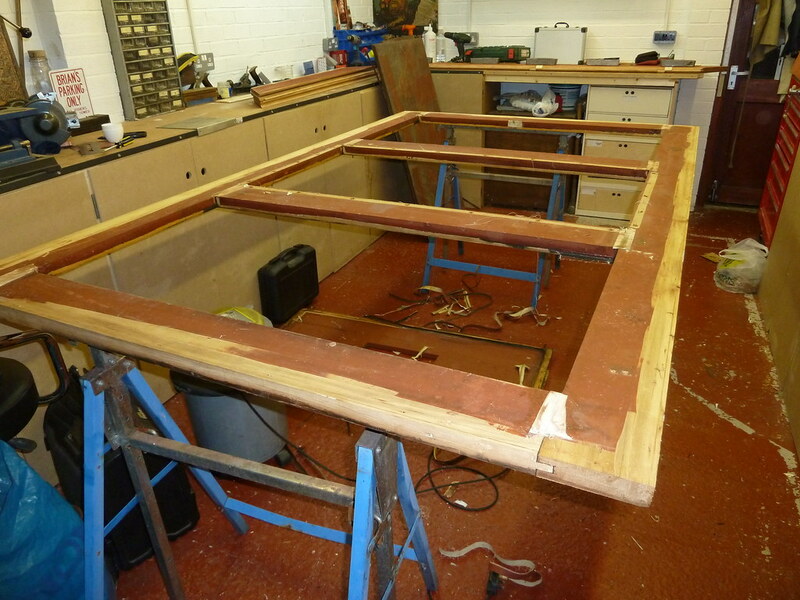 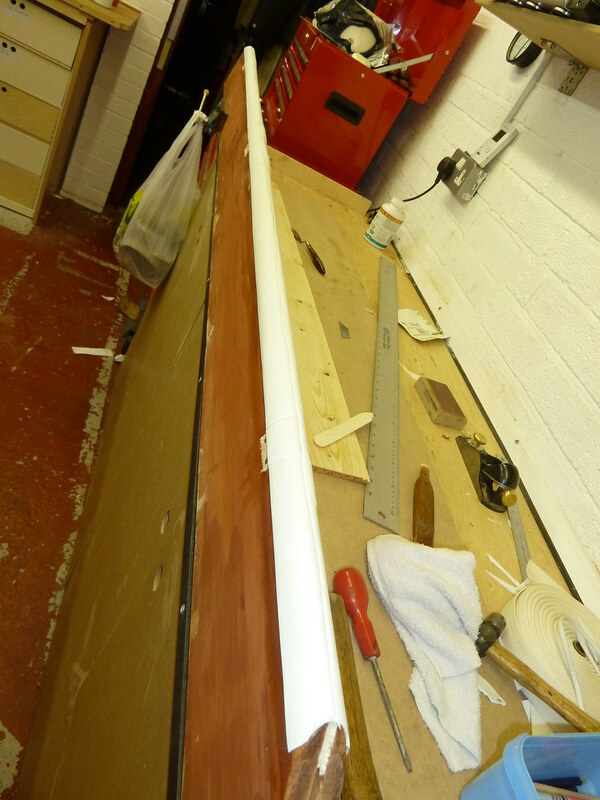 Sides now removed ready for the leather and glue to be removed.